While the continuous expansion and maintenance of South Africa's road network generates billions in revenue and employs tens of thousands of individuals, barriers to entry for newcomers are restrictive due to the high cost of capital equipment and lack of expertise within the field. 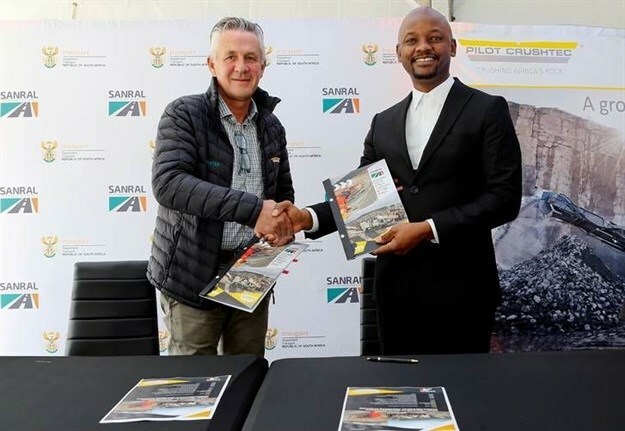 With this in mind, Pilot Crushtec and Sanral have signed a memorandum of understanding (MoU) that will, among others, give small to medium enterprises access to the expertise and machinery required to tender and execute major Sanral projects. Pilot Crushtec CEO Sandro Scherf and Sanral CEO Skhumbuzo Macozoma shake hands following the MoU signing ceremony at Pilot Crushtec in Boksburg. Pilot Crushtec will equip up-and-coming contractors and quarry owners with the opportunity to be educated by their team of experts who have over 30 years of experience in the field on how to get the most out of their operations. “Additionally, we would really like the opportunity to promote our locally produced products for road building,” says Pilot Crushtec sales and marketing director Francois Marais. “These products are world leaders in the space and are exported to a number of international locations for manufacturing top grade road stone and aggregates.